Girlfriends should be cherished and a great way to do this is to have a Girls Night In. Invite your closest girlfriends over for a night of old fashioned cocktails, finger foods and Cary Grant. Pick out a collection of your favorite classic movies, such as Roman Holiday and Casablanca, and celebrate your girlfriends in style! Food: An array of light finger foods is best for a night like this- my suggestions are citrus marinated olives (recipe below); grilled baguette slices with a piece of green apple and a slice of brie; skewers with a cherry tomato, cube of good mozzarella, cube of quince paste, a mint leaf and drizzled with honey; cheese straws (see recipe below); and lemon sugar cookies. Drink: Offer three different classic cocktails- Sidecars, Kir Royales and Martinis. Play the role of bartender if you like, but another solution is to print out the recipes, laminate and place the instructions on the bar beside the ingredients. Allow your guests to play and they might just invent a new sensation. Also be sure to have bottled water and tea on hand. Music: Let the movie be your soundtrack for this party. Have the volume at medium, allowing people to watch and mingle without competing with the noise. Be sure to arrange furniture away from the viewing area, allowing people to congregate and chat. Also, where there is a place to sit, there should always be place for drinks and/or a plate. Decor: Bring out all of your favorite framed photographs of your friends and place them all over the gathering space. Also, pick out one or two friendship quotes- copy it onto card stock and place in a pretty frame. For flowers- be creative! Rosemary is a symbol of remembrance, so a nice touch would be to use small rosemary plants for decoration. Be sure to take a group picture and give each guest a package of rosemary seeds as a favor. Cover olives in cool water; soak for at least 5 minutes or up to five hours. In a 1 quart container, combine all remaining ingredients. Add olives and stir to combine. Make sure that the olives are submerged in the marinade. Let sit in a cool, dry place for one day. Refrigerate for 1-2 days before serving. 8 ounces extra sharp cheddar cheese, at room temp. 1/2 cup butter, at room temp. Preheat oven to 400 degrees. In a food processor, process cheese and butter until creamy. In a medium bowl, combine flour, baking powder, and Cayenne. Add the dry ingredients to the cheese mixture. Pulse until dough forms a ball. Place dough on a lightly floured surface and roll into a 7 x 11 inch rectangle. Using a pizza cutter, slice the dough in half lengthwise. Make 20 horizontal cuts. Gently transfer cheese straws to an ungreased baking pan. Bake for 10-12 minutes or until lightly brown on bottom. Allow to cool completely on cooling rack. Makes about 80 straws. This entry was posted on 8:26 AM and is filed under Girls Night In , saturday soiree . You can follow any responses to this entry through the RSS 2.0 feed. You can leave a response, or trackback from your own site. The perfect night out....Have a wonderful weekend, xv. Wish I could be there with you!! Oh, the perfect night in, please invite me! I love those old movies, I must watch more of them. Love the Consummate Hostess!! Be sure to use this idea next time I entertain...and you need to get up here and join!!!! I'm going to have one next Friday. You always plan the most fabulous parties! what a great and fun idea! 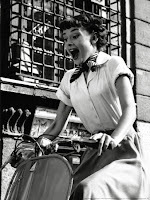 Roman Holiday is one of my favorite movies! I love a girls night in and this is a fabulous idea. Thank you. You've picked one of my favorite all time movies and I love your tips for hosting a girls night! I might just have to gather the girls around and do a diva's night in! This sounds lovely! 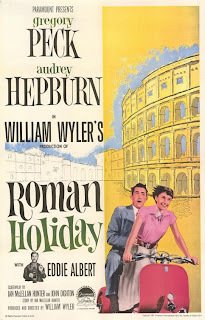 Roman Holiday is one of my faves! Ooh, I had a girlfriend night on Friday! It was the best!